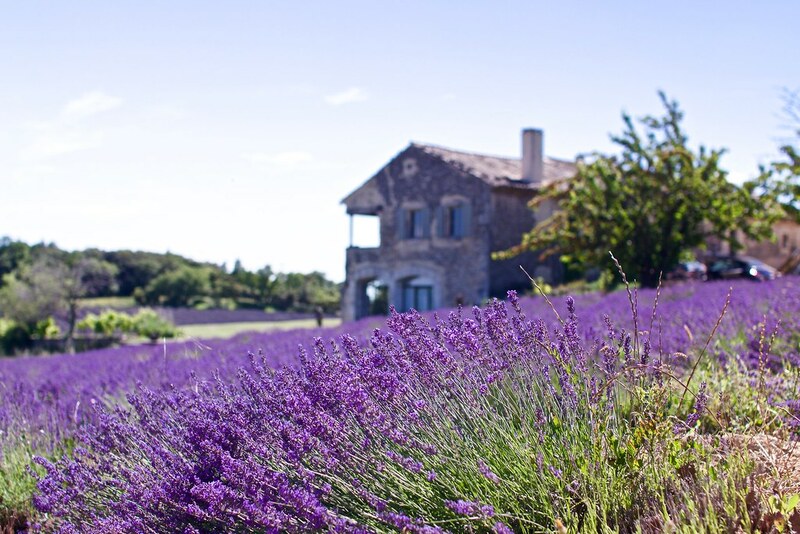 Who hasn’t dreamt about cycling the lavender route in Provence ? The warmth of the provencal sun, the cicadas singing in the pine trees, the blue sky, the olive trees… and of course the lavender fields ! Oh boy, do I love this region. It was time for Antoine and I to explore a little bit more this beautiful part of France. We were luckily invited to explore this stunning region by So Provence So Alps, a travel agency specialised in Provence bike tours based in Nyons. So far our cycling journey around France started in Alsace, in Eastern France, took us to Burgundy, a region famous for its wine and alongside the Rhone river, on the ViaRhôna cycling route. After the city of Valence, 100 kms south of Lyon, the ViaRhôna cycling route has not yet been finished. Instead of cycling alongside cars and trucks (which is not a pleasant thing to do), you can instead follow one of the many cycling routes in Provence. Here is our 2 days itinerary through the Drôme Provençale. We started our 2-days itinerary on the Lavender route in the Provencal Drome, the southernmost part of the Drome department bordered by the Rhône river in the West and the Mount Ventoux on the East. Since this region is quite hilly (to say the least…), we swap our regular bikes to continue on electric bikes which ‘L’Etape du Ventoux’, a bike rental shop based in Beaumes-de-Venise lent us. There are so many things to do in Provence and places to visit that we of course, couldn’t visit every single one of them, but here are a few suggestions on what to do in Provence. Our first discovery of the day was the Aiguebelle distillery located in Valaurie. 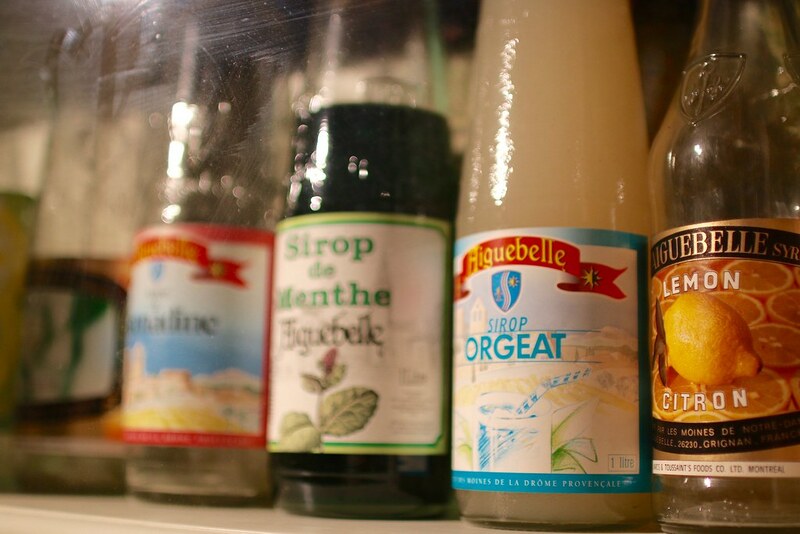 The brand Aiguebelle or Eyguebelle, is very famous in Provence for its sirups. The name ‘Aiguebelle’ rings a bell ? You’re probably thinking of the Aiguebelle monastery, 10 kms away from the actual distillery. The Cistercian monks of Montjoyer created the Eyguebelle brand in 1137 and their craft has been carried on over centuries until today. The original name, Eyguebelle, comes from the Provencal word “Eygue” meaning water and “belle” meaning beauty. 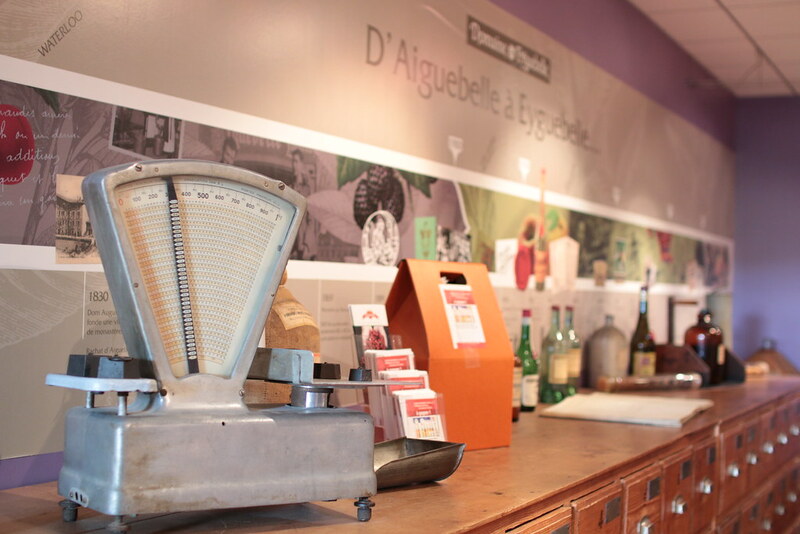 Aiguebelle Distillery has opened a free museum where you can learn more about sirup making. 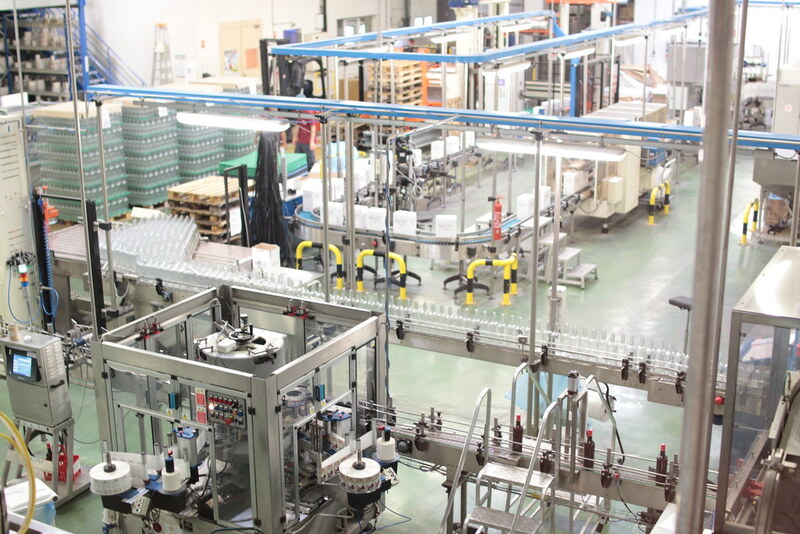 We visited on a Tuesday and were able to get a glimpse of the bottling process. Try and come by during the week too so you will be able to see the distillery operating. After trying out a few original sirups like basilic and cactus, we continued our route towards the Plateau de Clansayes. We passed by the typical provencal villages of Valaurie & Chantemerle les Grignan. We were planning to stop for lunch in Valaurie where there were a few different options from a boulangerie to a fancy restaurant but somehow we decided to continue towards Chantemerle les Grignan and try our luck there. THIS is where you will need an electric bike. Not kidding, if you want to cycle all the way to the plateau de Clansayes to visit this unique Lavender Farm, you’re either a professional cyclist / cross-fitter OR you have an ebike (especially during Summer). When we arrived in the Lavender Farm on the Plateau de Clansayes we were NOT pretty. We must have looked like we were desperate as Odile, the owner, generously offered us some food. A life saver ! I can tell you, you don’t want to see me on a hungry stomach. Just ask Antoine. Anyways, back to our visit of the Lavender Farm. 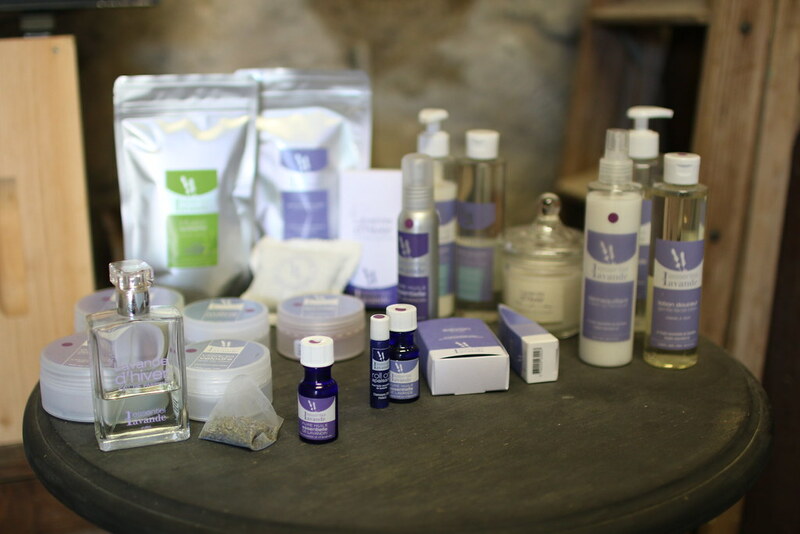 L’Essentiel de Lavande produces 100% natural essential lavender and lavandin oils extracted from the organic lavender fields cultivated on their 300-meters high production site overlooking the Mount Ventoux. They offer tours of the Domaine where you can learn more about the process of producing lavender essential oil. Our visit started with a sensorial test to make the difference between the 3 main types of lavender : fine lavender, lavandin and aspic lavender. 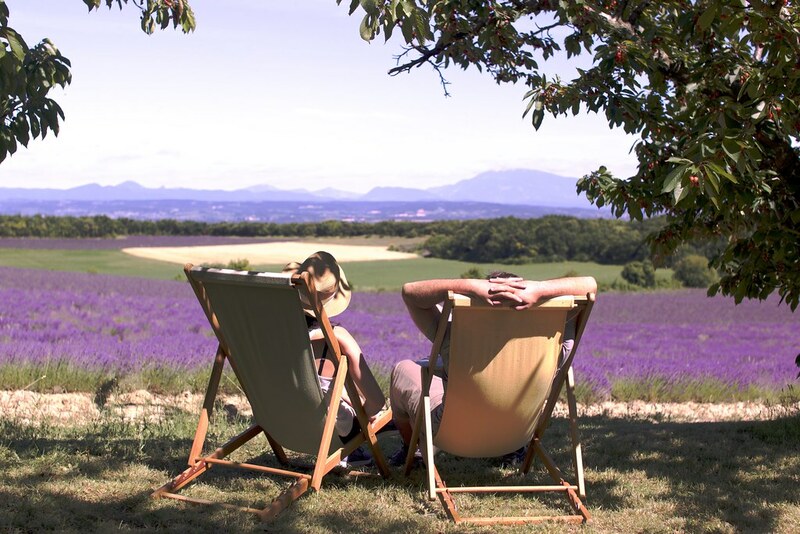 Continuing our tour in the lavender fields you can then learn how to spot the differences between the flowers and finish with a glimpse of the distilling process, whilst enjoying a spectacular view. The shop is full of treasures any traveler will be happy to purchase, since lavender essential oil has many health benefits like improving sleep or soothing mosquitos bites. I personally had a crush on the perfume designed by Odile herself (too bad they’re not making travel bottles though !) and also loved the purifying herbal tea. 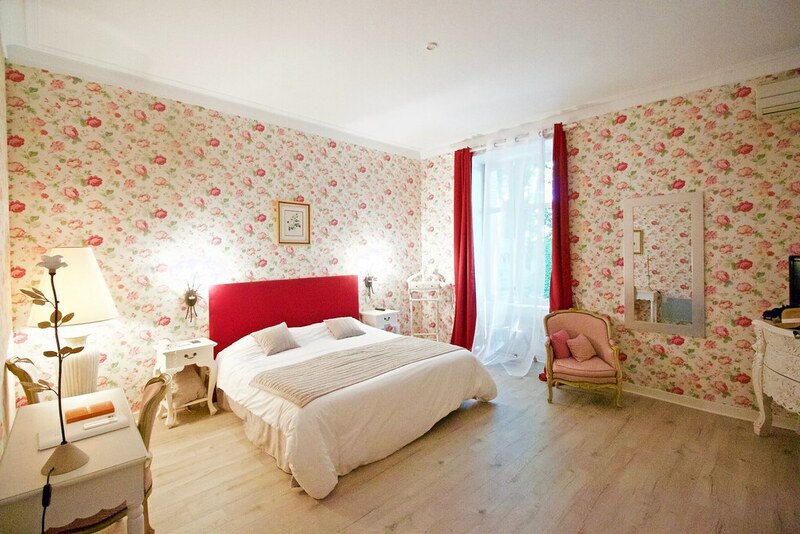 Who wouldn’t love a night and dinner in a 4-stars 19th century Provencal Manor ? 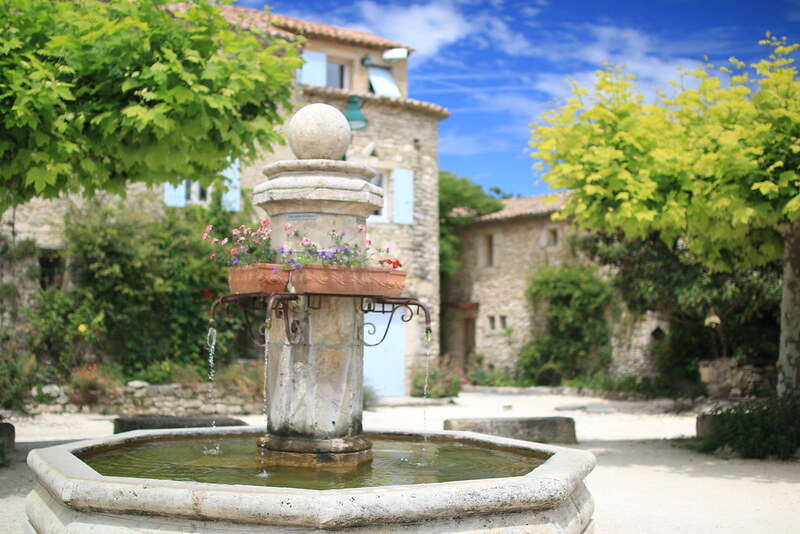 We got to experience what life is like a in Provencal Chateau and well… when do we move in ?! 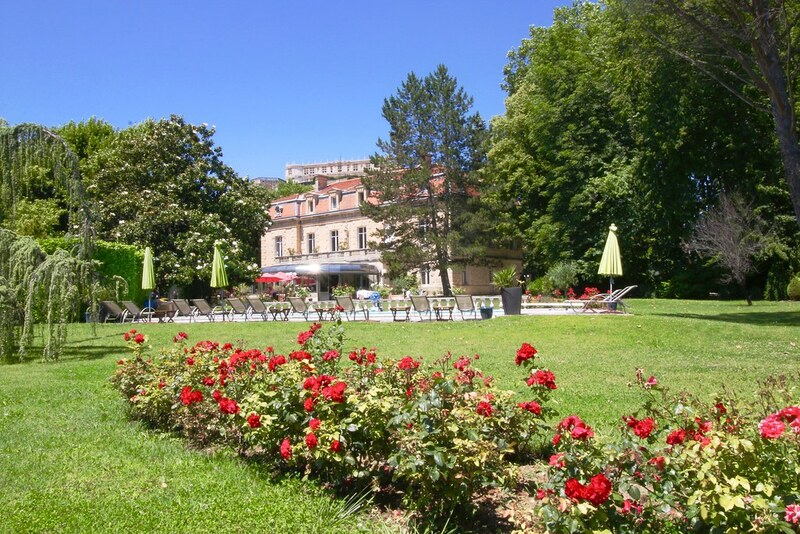 If you are looking for the best hotel in Provence for your honey moon or a romantic weekend getaway : this is it. First things first, we jumped in the swimming pool ! Well deserved after a day cycling in the rotting sun I would say. And after relaxing in our luxurious bedroom with a bathroom the size of my student flat in Paris, we enjoyed a candle light dinner on the terrace of the restaurant. Typical Provencal cuisine, tasty flavours and excellency were on the menu that night, with dishes as beautiful for the eyes as succulent on the palate. A special thanks to the sommelier who let us taste some excellent local wines beautifully accorded to our food. An evening we will definitely remember. 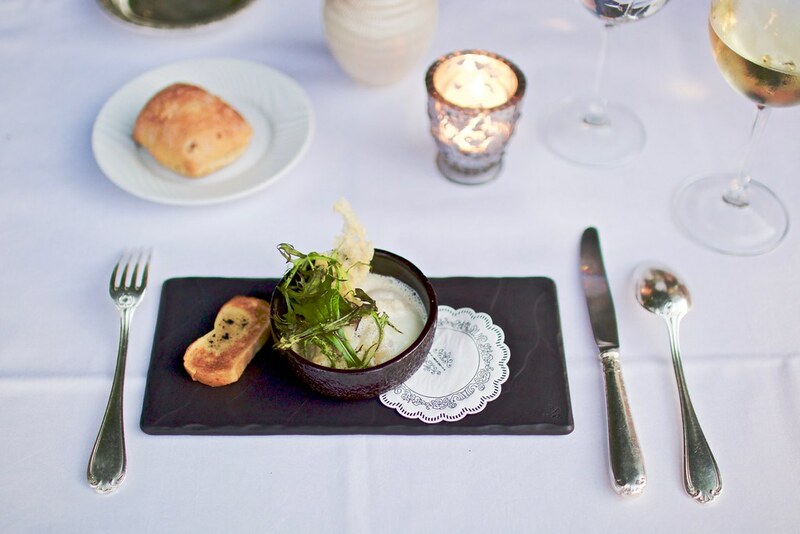 If you don’t want to spend money on a hotel night, we recommend you to try out their restaurant either for an afternoon tea, lunch or dinner. The gardens and interiors of the Manor are well worth a visit. 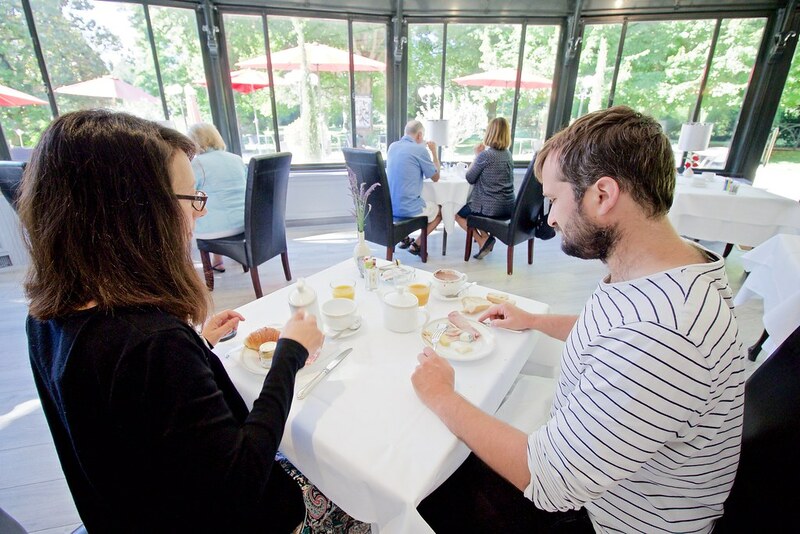 The next morning, after a delicious breakfast in our Manor (yes, we call it home now) and a short walk in the beautiful park and rose garden, we headed towards the city centre and the castle for a cultural visit. 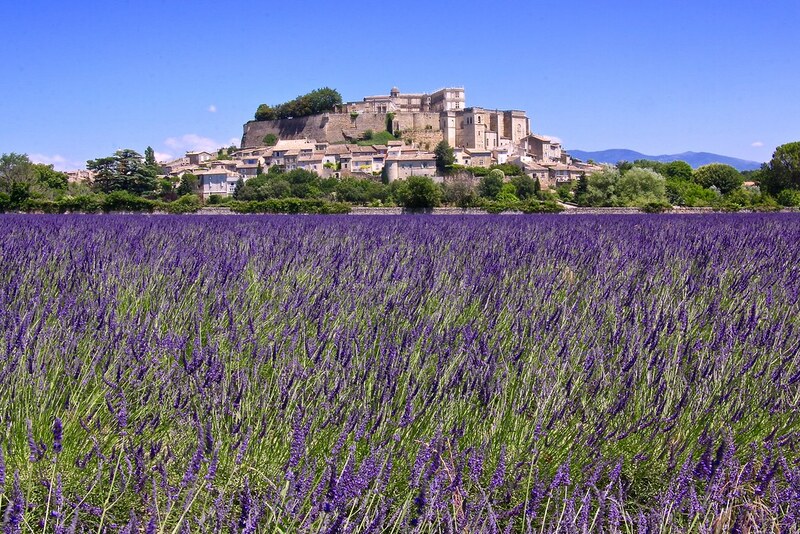 Emerging from the lavender fields, the castle and town of Grignan appears like the Mont Saint Michel in a purple sea. The medieval hilltop village of Grignan was founded in the 11th century and developed around its castle. 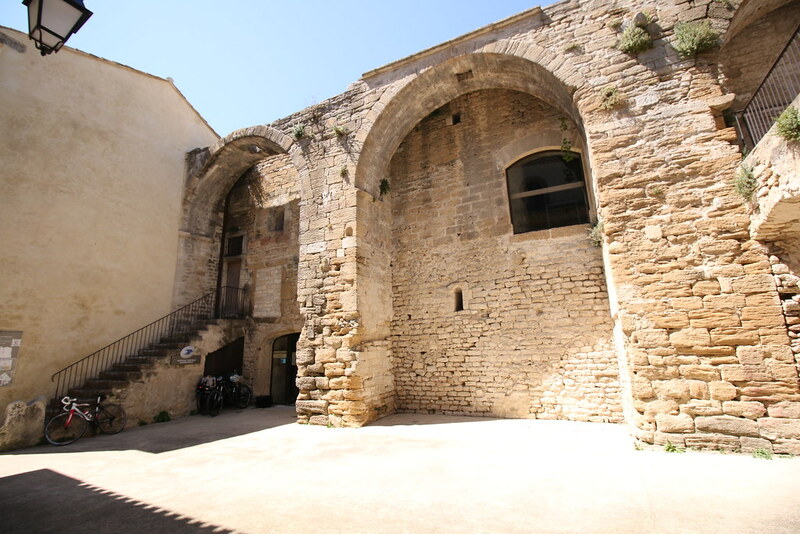 It is a gem of Provencal architecture and a remarkable monument overlooking the Provencal Drome. Grignan castle is famous for the visits of Marquise de Sévigné, a famous French writer, who wrote many letters to her daughter, wife of the Count of Grignan. The Marquise de Sévigné’s letters are very valuable to French history as she describes in details the traditions and customs of the 17th century people and court life. 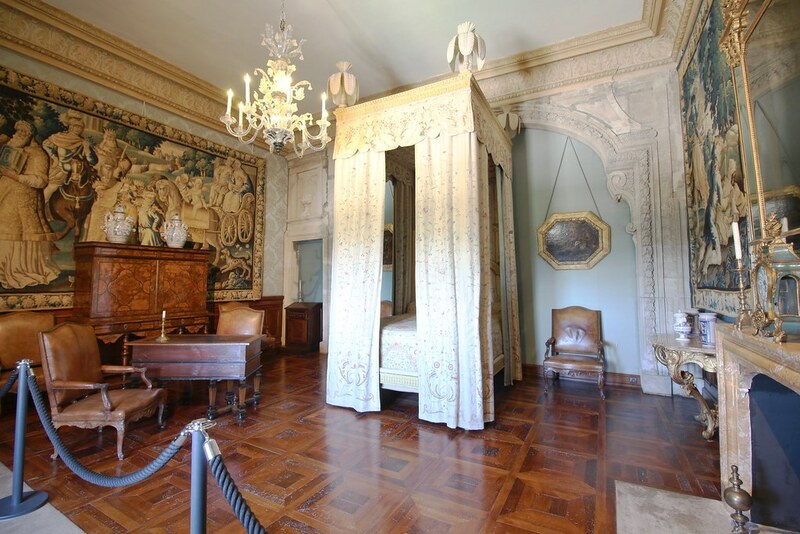 The interiors will take you through the history of one of the most important castle in Provence, with furnitures and works of art dating mainly from the Renaissance. Owned by the Adhémar family, it was a fortress in the 13th century and then turned into a luxurious castle in the 17h century. It didn’t survive the French Revolution like many other monuments and was turned into ruins in 1793. It’s only during the 20th century that it was rebuilt thanks to Mrs. Fontaine who invested all her fortune in the reconstruction work. The 500 square meters terrace on top of the church is stunning : it is the first time we saw a church’s rooftop turned into a terrace ! 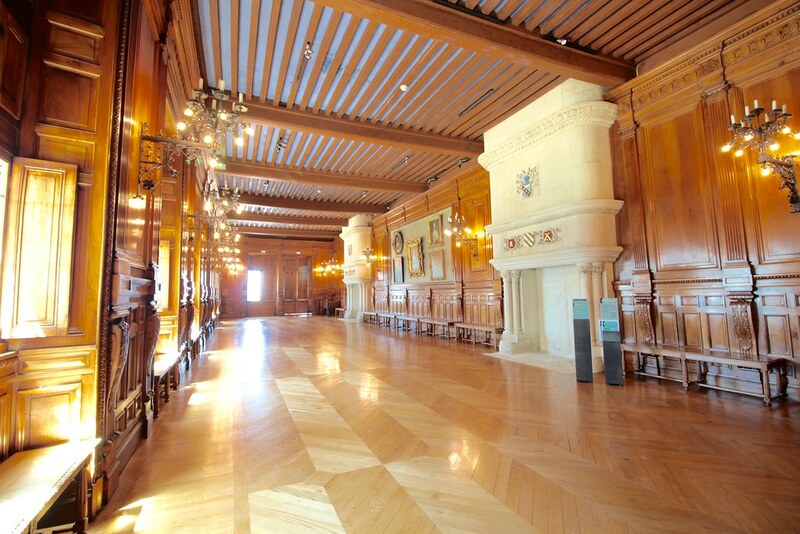 The wooden gallery is also a remarkable room and a must-see. And finally, notice the difference in the façades in the courtyard, the left one being Gothic and the right one Renaissance. 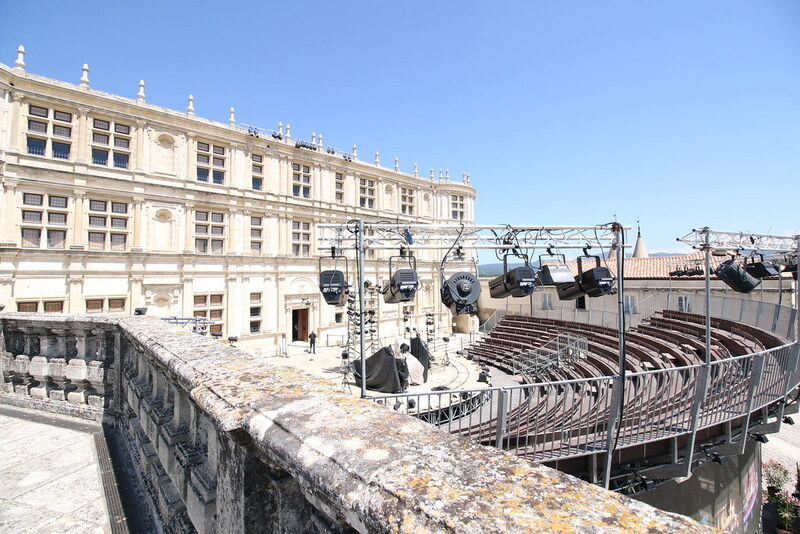 In the summer, the castle’s main entrance courtyard is turned into an open air theatre, showcasing plays and concerts at night. The bleachers and stage are taking away the pretty picture but still, it must be a great experience to see one of the shows. We continued our cycling trip through Provence with entering what is called the “Enclave des Papes”. This 120 square meters territory in Southern Drome is actually owned by the Vaucluse department, located around 2.5 kms away, and hosts 4 towns : Valréas, Visan, Richerenches and Grillon. This countryside is famous for its Templar history, Côtes du Rhône wines and truffles. The small medieval village of Richerenches holds an intriguing building : the Keep of the Knights Templar, dating from the 12th century. 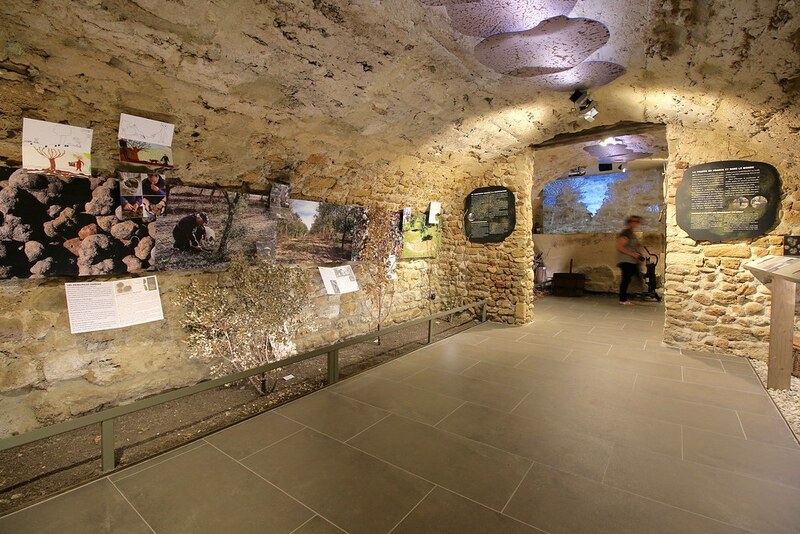 Inside this impressive Commandery is located the Museum of Wine and Truffles, a great reason to stop by and learn more about those agricultural traditions. Richerenches is known to be home of the best truffles with its famous Saturday morning market, Europe’s biggest truffle market. We tried to buy some products made with truffles in the village, like olive oil or tapenade (olive paste) but it’s very difficult to find real truffles, it’s usually an aroma they add to it. Truffle-growing is taking place in Richerenches since the 18th century, being complementary to viticulture. 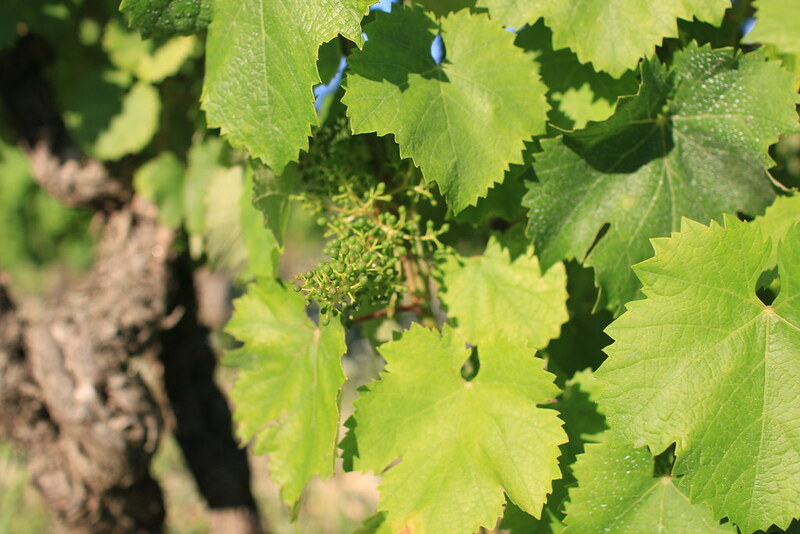 Viret Wine Estate is a family owned wine domaine making organic and biodynamic natural wines since 1999. 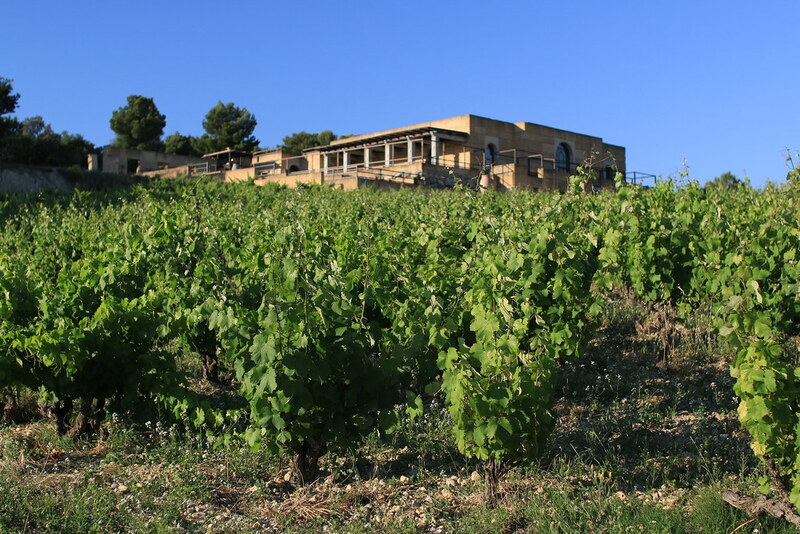 Their domaine is based in a place called “Paradis”, meaning Paradise in French, and which is also an ancient Roman place. Is that not a good enough reason to visit them ? But that’s not it. 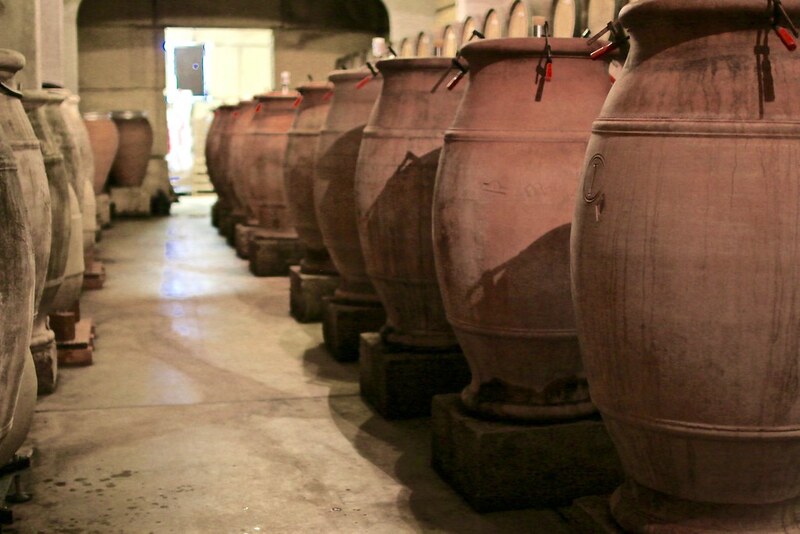 They are making wine following ancestral traditions, keeping the wine in amphoras for example. They also invented cosmoculture, a form of biodynamic culture adding a spiritual aspect. The goal is to a find a balance and reenergize the earth energies, in order to guaranty and protect the ecosystem. Now you may think what is this woo-woo nonsense all about ? 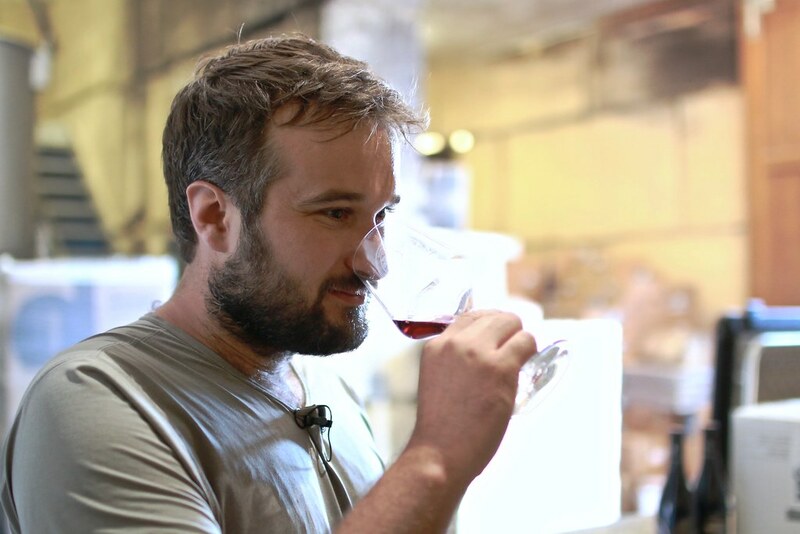 This method is basically in accordance with the nature’s own cycles and energy, guarantying us to drink the most natural wines. Bye bye sulfites, sugar and hangover. Their wines are ranked as “Vins de France” which are supposedly the lowest wine appellation but it doesn’t reflect at all the quality of their product. We walked around their property, which was built like a roman house, and got to see their wine cellar displaying the amphoras. Then we got to the interesting par : wine tasting ! We found their wines to be unusual, in a good way. Which is actually always the case when trying organic and biodynamic wines. They were surprisingly full-bodied, generous and floral. An unusual and nice combination ! All in all, if you are visiting the region, we definitely recommend you to visit Viret Domaine, learn more about their method, discover their amphoras cellar and taste their unic products, in their beautiful setting. Our 2 days itinerary around Provencal Drome ended up on this original note, leaving us with beautiful memories tinted in lavender purple and images of vineyards in sunset. We fell in love with that region of France and wished we could have stayed longer to explore more. It is now on our bucket list to go back and visit the rest ! 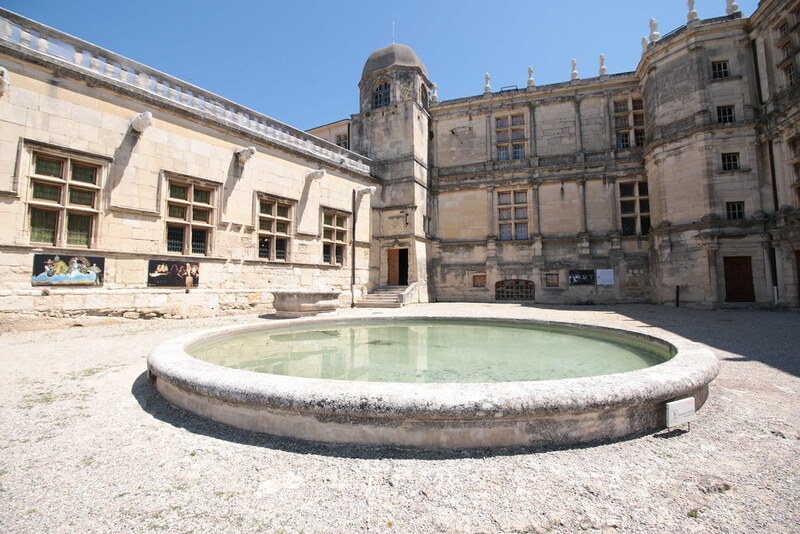 • Grignan Castle — Opening hours : Sep.- Jun. : everyday 10-12.30am / 2-6 pm. Jul-Aug. : 10am-6pm. Closed Tuesdays from Nov. 1st-Mar. 31st, 1st Jan., 11th Nov. & 25th Dec. Fares : 3-5€. Guided tour : 6€. What about you ? 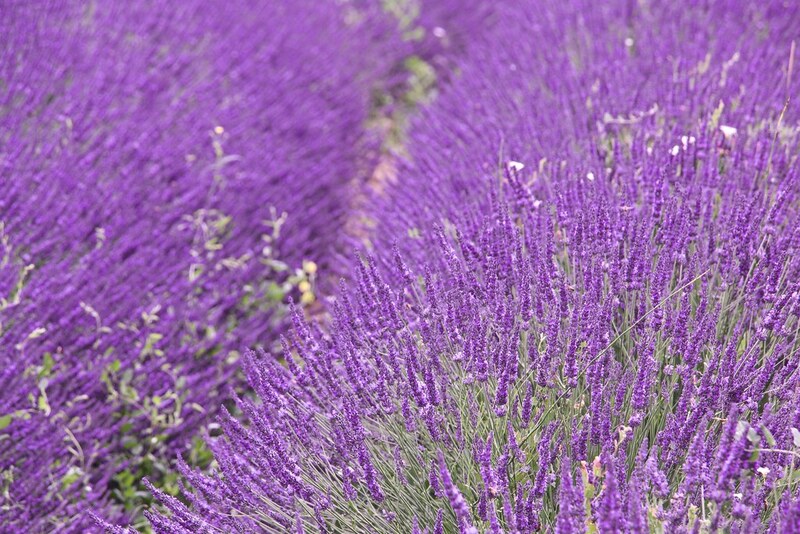 Was the lavender route in Provence on your bucket list or is it now ? Let us know in the comments ! Hope to see you again around our beautiful provencal region! In summer for lavender of course, but also at every season for the olives, cotes-du-rhone wine, or truffles…! We can’t wait to go back ! Superbe et site très bien fait, un vrai plaisir un rêve à mettre en application, merci.